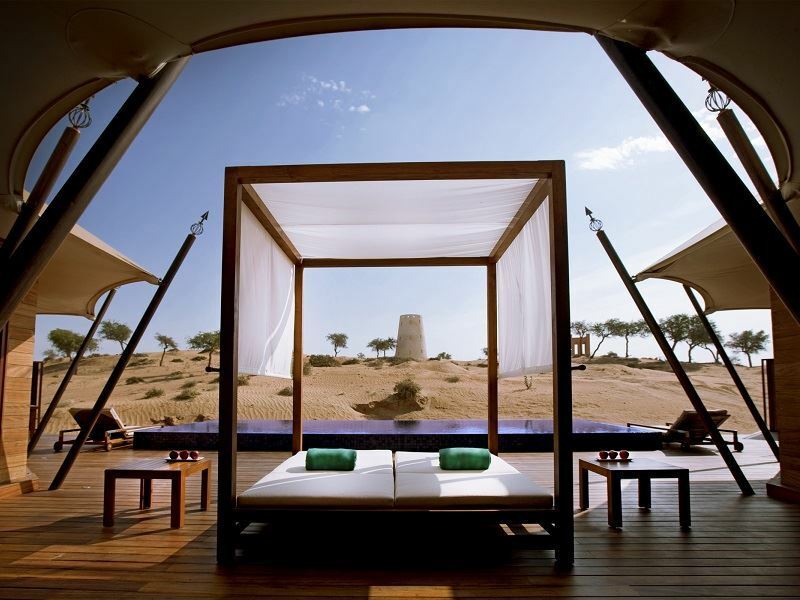 Why visit Dubai and the Emirates? 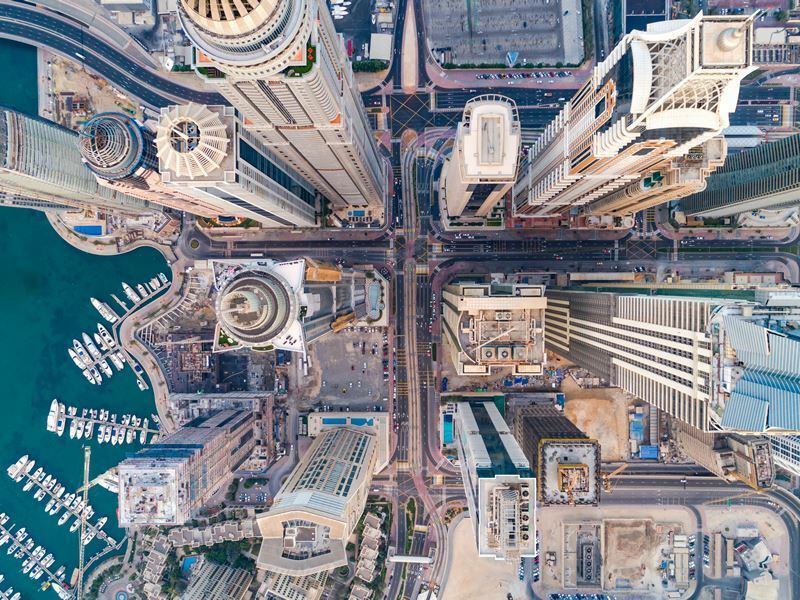 Experience the bright lights of Dubai, with its incredible hotels, theme parks and bustling souks and check out the views from the Burj Khalifa. When you’ve had your fill of Dubai’s many attractions and diverse cuisine, why not spend time exploring some of the neighbouring Emirates? Ajman, Fujairah and Ras Al Khaimah are all within easy reach and perfect for combining with a stay in Dubai, on a day trip or as destinations in their own right for an alternative to Dubai. You’ll find a multitude of sights and activities everywhere you go, from cultural visits to mosques and museums to high-adrenalin pursuits. Hire a car and follow the long and winding road to the top of Jebel Jais in Ras Al Khaimah - this is the UAE’s highest peak and home to the world’s longest zipline, where you can have an experience at heights and speeds you’ll never forget. For underwater adventures, go to Fujairah which stretches along the Gulf of Oman and spot clownfish and turtles while snorkelling on Snoopy Island. There are also superb diving opportunities to be had here among the diverse marine life and clear waters. For mountain adventures, go to Ajman, where the rough and rocky trails of the Hajar Mountains attract mountain bikers. Or, just enjoy the scenery and a bit of wildlife spotting; with falconry displays, camel rides and desert safaris making for the perfect Arabian experience. The best time to go to Dubai and the Emirates is between November and April when temperatures remain more comfortably in the mid-20s and rain is very scarce. All buildings have some pretty powerful air conditioning, but you’ll need to have a high tolerance for heat if you travel in the summer, with temperatures getting into the forties. A dip in the sea will feel more like a warm bath than a refreshing dip. Head to Dubai, Ajman, Fujairah and Ras Al Khaimah during the winter season, when the humidity drops and you’ll have a far more comfortable experience. The weather in Dubai and the Emirates is invitingly warm and sunny all year round. November to March are the cooler months, with the average maximum temperature being 25°C. June to September can be seriously hot and will often exceed 40°C. You’ll be very grateful for the air-conditioning, hotel pools and waterparks. 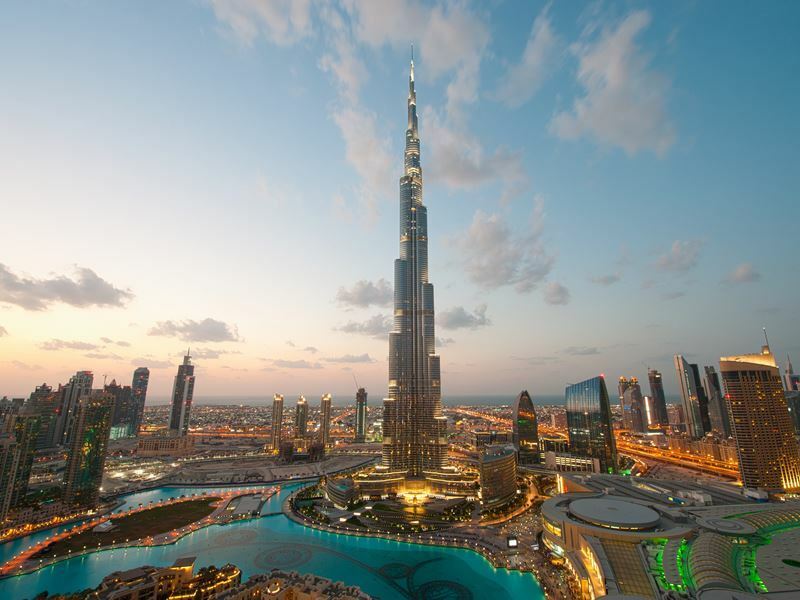 Direct flights operate from London to Dubai International Airport and take approximately 6 hours and 45 minutes, while direct flights from Manchester take approximately 7 hours and 30 minutes. Indirect flights usually stopover in Doha or Muscat with varying stopover times. The best way to reach the other Emirates: Ajman, Fujairah and Ras Al Khaimah, is by flying into Dubai International Airport. Most of Dubai’s resorts and hotels are less than an hour from the airport even at the busiest times. Fujairah is three hours by road, Ras Al Khaimah is 50 minutes and Ajman, just 20 minutes away. If you’ve pre-booked transfer arrangements with us, you’ll be met at the airport by a Tropical Sky representative who’ll guide you to your transfer vehicle. Book our optional Meet & Greet service, which is ideal for first-time visitors, families, and older holidaymakers. 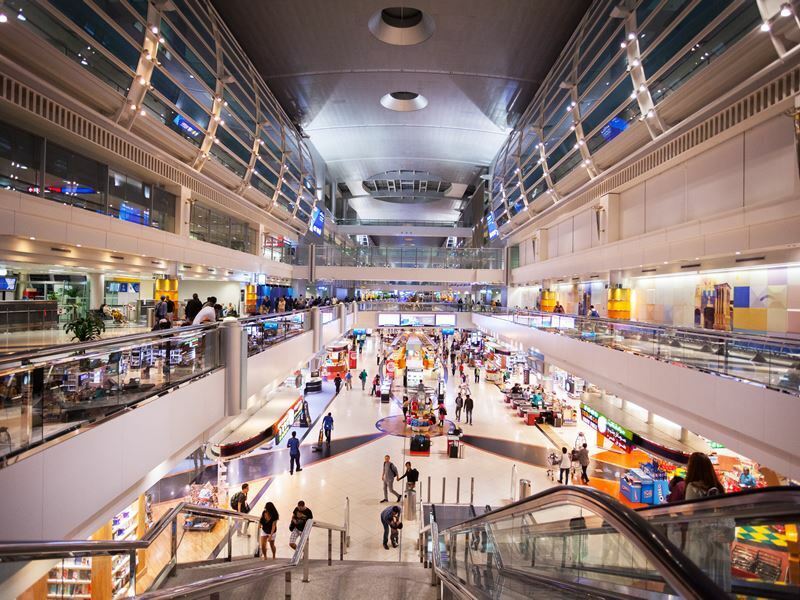 On arrival at Dubai International Airport, you’ll be met by a representative, who will guide you through immigration, baggage claim, and then to the dedicated waiting area where a Tropical Sky representative will take you to your transfer vehicle. This service will need to be booked a minimum of 48 hours prior to arrival. Bronze Meet and Greet: £24 per person. £75 per Family Package for two adults and two children, then a further £24 for additional family members. Lounge for Family Package £26 per person. Free for infants under two years old. Silver Meet and Greet: £37 per person. Free for infants under two years old. Gold Meet and Greet: £69 per person. Free for infants under two years old. British citizens don’t require a visa before arrival in the UAE. You’ll receive a 30-day visa on arrival at the airport, seaport or land border. British Citizens travelling to UAE require a full British passport which must be valid for 6 months after departure from this country. All children and infants must also have their own passports. Please check up to date visa requirements with the Foreign Office. The official language in Dubai and the Emirates is Arabic although English is widely spoken, especially in the main tourist areas. Dubai’s public transport system is the best in the Middle East. That’s not to say that it has reached western standards; cars are still the primary means of getting around – visitors generally use taxis for most journeys if the hotel does not provide a shuttle bus and this is our favourite way to get around Dubai. Take a look at our guide to getting around Dubai and where to stay for more information. The local currency is the United Arab Emirates Dirham (abbreviated AED or dhs). Credit cards are widely accepted in all the large hotels, shops, malls and attractions, although some small local restaurants and markets may only accept cash. The voltage used in Dubai and the Emirates is 220V and the frequency is 50 Hz. You’ll need a standard UK three pin plug to recharge all your appliances. No special vaccines are required, but we recommend you consult with your GP or visit a specialist travel clinic well in advance of travel for up to date information. The summer heat can reach temperatures as high as 50 Celsius – if you’re not used to this kind of heat it’s advisable to keep outdoor activity in the middle of the day to a limit. The water is completely safe to drink, and it’s a good idea to drink as often as possible as you can become dehydrated very quickly. All guests staying at any accommodation in Dubai and Ras Al Khaimah will have to pay a local tax on check in - the fee will be levied per occupied room per night. Please call our travel experts for further information. Dubai is GMT + 4 hours. Ramadan: The holy month of Ramadan will be celebrated in the late summer (05 May - 04 June 2019 - subject to change). During Ramadan, Muslims all over the world abstain from food and drink during daylight hours. Non-Muslim holidaymakers are able to eat and drink as normal. However, hotels impose certain restrictions on alcohol, food consumption and entertainment between sunrise and sunset. Eid Al Adha: The Festival of Sacrifice is the second most important festival in the Muslim calendar and falls between sunset on 11th-15th August 2019, starting with a 24-hour dry day followed by three days of celebrations. Please ensure you are aware of these restrictions, and also that these dates may be subject to change. These are culturally interesting dates for visiting Dubai and the Emirates, so don’t be put off. Dubai and the Emirates are home to many nationalities and therefore you can expect a huge variety of cuisine. From vegetarian curry to rich Lebanese dishes, American classics or Italian favourites, you’ll find it all. 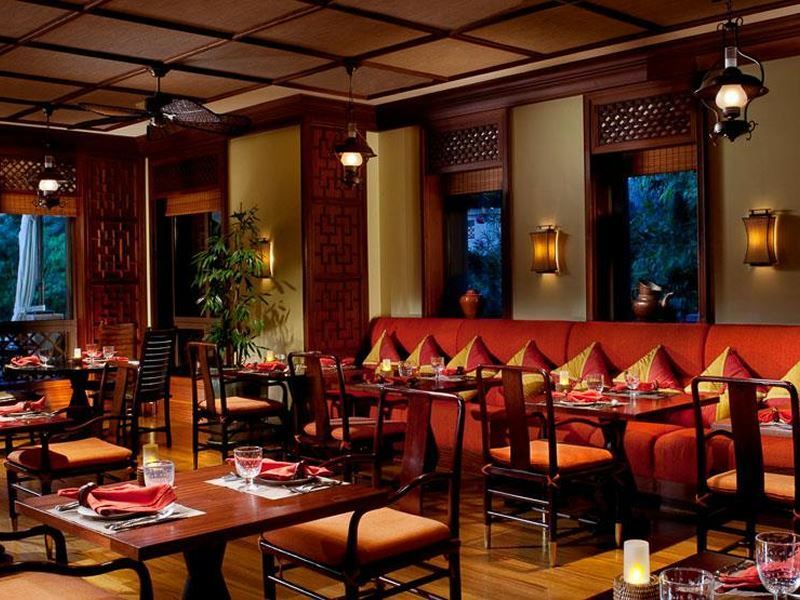 The hotels have excellent restaurants, offering plenty of choice for different tastes and pocket size. You can spend a few pounds on a delicious Indian meal, try out the convenience foodie places within the malls or splash out some really decadent dining. Be sure to try a Friday brunch while you’re in Dubai. Dubai has a more relaxed attitude to alcohol to many other parts of the UAE and you’ll find a thriving night scene, with bars, nightclubs and world-class DJs. There are romantic spots for chilling out, swanky cocktail bars and all the hotels generally have at least one bar or club. It’s worth remembering though, that the UAE operates under conservative Islamic laws and therefore alcohol is only served at licensed premises and drinking in public is illegal.